Festive lights on the streets of Rotterdam and the sight of white-bearded man arriving by boat from Spain marks the beginning of not just the cold Dutch winter, but also the joyful holiday season. 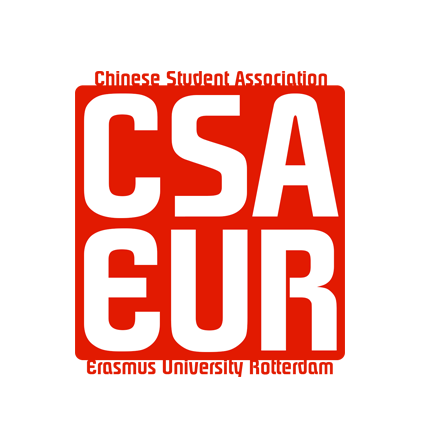 At this time of year, the Chinese Students Association of Erasmus University Rotterdam (CSA-EUR) is in midst of preparing arrangements for the annual Christmas Gala. 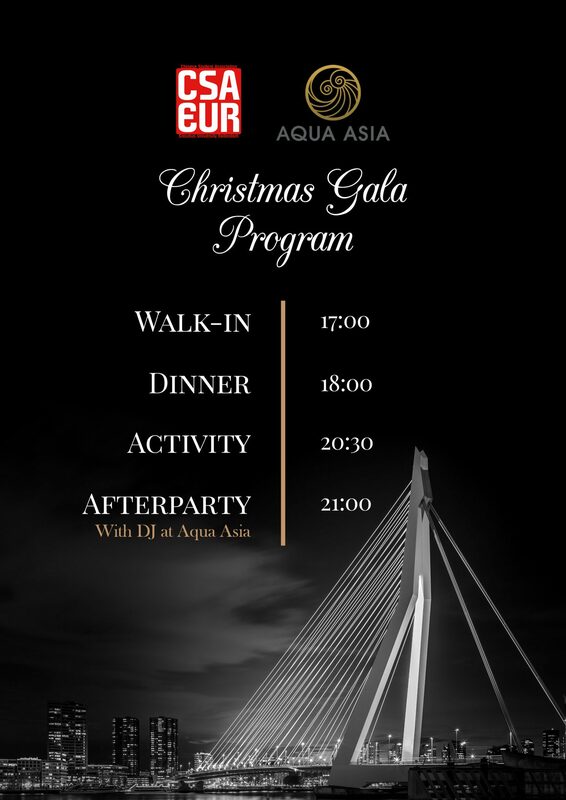 This year, the events committee of CSA-EUR wanted to take the gala to a new level by adding an after-party to the program, and after scouting a wide range of locations ended up by the river at the upscale Aqua Asia. So far, the events committee has worked to put together a great menu, prepared a table setting to match, and overcame an initial misfit in the date of the event. But as with any large event, the planning wasn’t without difficulties. Despite the myriad of restaurants situated in Rotterdam, one of the difficulties faced by the events committee was venue selection. To find the ideal location to host the Gala, we listed some of the factors that we thought were of greatest importance, with these being: warm atmosphere, intimate setting and budget. After coming up and contacting an initial list of restaurants, we fine-tuned our list further by looking at the dishes offered and opted to give preference to Asian-inspired fine dining cuisine considering the nature of CSA-EUR. Finally, after paying a visit to our top choices and negotiating on a final menu, we settled on Aqua Asia. With the approaching of the date of the Gala, the events committee are looking to brush up on the finer details of the event; red carpets, gifts, and ambient music. And as small and irrelevant as some details may seem, the neglecting of such details are what often creates the major issues, and the attention to such details are what makes an event memorable. As Steve Job’s once said, “details matter, it’s worth waiting to get it right”. With hours of planning behind the Gala we expect it to be a night to remember! 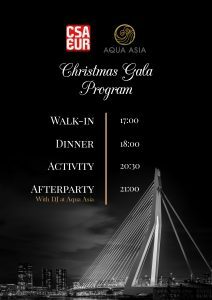 Christmas Gala 2016 is hosted in Aqua Asia on the 19th of December. For more information about the prices, menu and program, click here.